As you enter the Church of the Holy Sepulcher you can climb a set of stone stairs on the right. This stairway, according to tradition, leads to Calvary and contains a huge rock which is believed to have been split when Jesus uttered the words, “It is finished!” The rock can be seen under glass on both sides of the altar, and beneath the altar there is a hole said to be the place where the foot of the cross was lodged. Due to the significance of this, it is the most visited site in the Holy Sepulchre church. A friend of my son Ron is Greek, and he says the words on the front of the communion table say, “I SEE YOUR GARMENTS ARE EMPTY, ALMIGHTY CHRIST,” referring to His burial clothes which remained in the tomb after HIS RESURRECTION!!! Zechariah 12:10 tells us that the Messiah will be pierced, and those who look on Him shall grieve deeply. In today’s reading we learn that this piercing is the source of a fountain for cleansing, “For sin and for uncleanness.” The redemptive work of Jesus on the Cross gave rise to a new and purified people of God, a spiritual Israel wherein there is no idolatry and no false worship. These are difficult words to understand in this chapter: “The sword against My Shepherd.” Read Isaiah 53:10-12 for another statement as to why the sword was turned against the Messiah Shepherd. What love!!! “It pleased the Lord to bruise Him.” How can our limited human minds grasp this? The final chapter of Zechariah appears to describe the terrible atrocities that will happen just prior to the coming of Jesus Christ in power and glory. He will cut short those days of terror. Zechariah 14:12, “…flesh dissolving while they stand on their feet,” is as close as one can come to describing what happens to the human body within the detonation area of a nuclear bomb. The animals present will suffer the same fate (14:15). The Lord will put the final period to the book of human history. In three more days, our readings move into the Revelation, the Apocalypse. The final victory over evil, and the eternal establishment of good is coming! Keep me faithful, Lord God, I pray! Give me the clarity of thought to be able to understand as much of these challenging Scriptures as my mind and Your Spirit can enable me to grasp. I rejoice in the promise of Your first coming when You opened a fountain for cleansing from sin. I also rejoice in the promise that reveals that You are coming again to rule and reign. In the Name of Jesus I approach You with “HOLINESS TO THE LORD!! !” Amen!!! Yours, looking forward to that day when “His feet will stand on the Mount of Olives” once again (Zechariah 14:4). Jesus changes everything!!! The Altar area inside Saint Anne’s Church, next to the ruins of the Pool of Bethesda, Jerusalem. The message is that God’s altar is the Cross of Christ. Jesus said, “As Moses lifted up the serpent in the wilderness, even so must the Son of Man be lifted up, that whoever believes in Him should not perish but have everlasting life” (John 3:14,15). God is speaking through Zechariah. The words, “I WILL” make it clear that God is committed to the time when the people of Jerusalem will look on Him (GOD) “whom they have pierced.” This was written 500 years before Jesus was crucified, and while the people looked on Him as He hung on the Cross, it refers to a yet future time when Jesus will come again. They will see Jesus in His resurrected Body, in which the wounds of His crucifixion are visible. Other prophets wrote of the One Who was “wounded for our transgressions” (Isaiah 53:5-6), and “They pierced My hands and feet” (only in crucifixion, and written centuries before any historical record of this method of execution). Read King David’s prophecy found in Psalm 22:16-18. To read one of the records of the crucifixion of Jesus, read John 19:34-37 and then read John 20:26-31 (prophesied in Zechariah 12:10 and 13:6). Make no mistake about it! Nobody other than Jesus fulfills these prophesies. Dr. Mark Hitchcock, a former attorney and now a professor at Dallas Theological Seminary, appeared on the 100 Huntley Street telecast with a message called, “The Shadow of the Cross.” He documents the impossibility of the words of the prophets, including Zechariah, coming to pass as they did by accident (click here for Dr. Hitchcock). Lord God, my heart is so very sad as I think of how You must have grieved “as One mourns for His only Son.” As Jesus is there, one with You at Your throne, You can see the marks on His hands, His feet, and His side. You gave Your “only begotten Son, that whosoever [me included] believes in Him should not perish but have everlasting life” (John 3:16). I pray that the scenes of Your Cross would continuously be before me. I believe “In Him” because You have shown me the One Who is “The Way, the Truth, and the Life” (John 14:6a) through the words of the prophets, the Apostles, and Your Holy Spirit’s revelation to me. Thank You! Thank You! Thank You, Jesus!!! Amen!!! I first saw the gruesome picture (below) when Dr. Paul Maier was my guest on the 100 Huntley Street telecast. Dr. Maier has a Ph.D. in semitic languages from Harvard and is professor of Ancient History at Western Michigan University. The photo shows a nail which was embedded in the ankle bone of a crucified man, according to the archeologists. There must have been a knot in the wood into which it was driven that bent the point of the nail. Of course, the Romans crucified others, including the two thieves who died on the crosses on either side of Jesus. Dr. Maier’s book, Skeleton in God’s Closet, is based on the facts of Jesus’ crucifixion, and then a fictional story evolves when it is claimed that the bones of Jesus have been discovered. This book, in my opinion, is most captivating, stimulating, and well researched. I guarantee that readers will find it very difficult to put it down having begun to read (click here to purchase Skeleton in God’s Closet). In the Israel Museum in Jerusalem, this heel bone with a nail pierced through it is on display, giving evidence for the ancient Roman practice of execution on a cross. Oh Jesus, how I grieve over my sins. You suffered crucifixion so that I, and all who believe in You, could be forgiven, saved from eternal death, and given as a free gift, eternal life. The Cross of Jesus was God’s altar where His sacrificial Lamb was sacrificed in human time, but in reality was “the Lamb slain from the foundation of the world” (Revelation 13:8). The Palm Sunday Church on the east side of the Mount of Olives is in Bethphage. This is where Jesus mounted the unbroken donkey colt and started His triumphal entry from the Mount of Olives and into Jerusalem. From this point onwards, Jesus left no room for doubt as to His claims to be the Messiah (Christ). A colt, the foal of a donkey… His dominion shall be from sea to sea, and from the river to the ends of the earth. It was very clear to every person in the vicinity of Jerusalem that Jesus’ ride on the donkey into Jerusalem meant that He claimed to be, and the people believed He was, Messiah, King of the Jews. To protect their Roman appointed and enforced positions, the Jewish leaders had to act to destroy Jesus quickly or the thousands of Passover pilgrims in Jerusalem would bring down the wrath of Rome on all Jerusalem and the Jewish people. Peter had even bought a sword with which to fight. When Jesus showed no interest in an armed overthrow of the occupying power and their Jewish backers, Judas tried to force Jesus’ hand, forcing Him into action at His arrest. All the people, His disciples, the Jewish leaders, and the Romans, failed to see that our key verses, known well by all, had two completely different times of fulfillment, the first and second comings of the Messiah. The people, including Jesus’ disciples, missed all the prophetic Scriptures which inform us of the lowly, suffering Messiah (Read Psalm 22…also read Isaiah 53). The donkey, the Bethlehem manger, and Jesus’ refusal to use His miracle-working power to help Himself, symbolized His first coming. He taught clearly that there would be another arrival in Jerusalem (Matthew 25:31-46). When He stood before the Jewish parliament He left no room for doubt when He was asked, “Are You the Christ, the Son of God?” His answer was to refer them to the prophet Daniel, another Scripture with which they were totally familiar. Jesus said, “Hereafter you will see the Son of Man sitting at the right hand of the Power, and coming on the clouds of Heaven.” Read Daniel 7:13-14. Also read and perhaps weep, Matthew 26:47-68. Lord God, as I read the Bible with the advantage of hindsight, it’s very clear that there are two very different times involved in the Messiah’s coming to rule and to reign on the earth. Once again today I bow before Him, confessing that He rules and reigns over my heart, my mind, and all of me by love and grace. I also confess that He is yet to come to rule and to reign over all the earth with great power and glory. I pray for a greater manifestation of Your love and grace through me! In the Name of the lowly suffering Saviour… the One who shall soon return in His second coming, Jesus Christ! Amen!!! I can identify with Jesus’ disciples (“talmudim” in Hebrew…used today to mean students). Over and over again Jesus had told them, as recorded in the Gospels, that He was going to Jerusalem where He would be arrested, crucified, die, and rise again. How did they miss it? There’s a Ben Franklin couplet that says, “Convince a man against his will, he stays the same opinion still.” I know myself well enough to say that once I think I have all the facts, and once I’ve made up my mind, it’s tough to change my mind. Just ask Norma-Jean! Let me give you just one example of what was going on with two of Jesus’ students, James and John. Both Mark and Matthew record the fact that Jesus took His disciples aside while they were travelling to Jerusalem and told them, with absolute clarity, that when they arrived at Jerusalem He would be mocked, scourged, crucified, and He would rise again the third day. He could not have made it more plain, but what was really on the minds of James and John? It was the planned request of their mother, “Grant that these two sons of mine may sit, one on Your right hand, and the other on the left in Your kingdom.” In this case, human pride and ambition made them incapable of actually hearing what Jesus had just said (Matthew 20:17-28 and Mark 10:32-45). Through the years, as I’ve read the Gospels over and over, I’ve come to realize that God is often speaking to me through His Word, and because I have my own plans, I don’t really hear Him. I have a recommendation for all blog readers. It’s this…at some point take just the Gospel of Matthew, take note of all the times Jesus tried to tell His students about His death, and see if you can find the reasons why Jesus’ message didn’t get through. Take those reasons and think about yourself and your reactions to God’s truth. You’ll learn, as I have sought to do, what the mental blocks are (for me I would call it thick-headedness!!!). P.S. O yes, I forgot to mention that Canada’s official motto, “A Mare Usque Ad Mare” (Latin for “From Sea to Sea), is taken directly from today’s reading, as well as Psalm 72:8. Also I wanted to write a special thanks to all blog readers who have prayed for me for healing from MDS acute leukemia. I truly believe that God has said “yes” in answer to your prayers for me. I feel so good that I’ll challenge any 79-year-old reading this to a race… ha-ha! As the doxology says, “Praise God from Whom all blessings flow! Praise Him all creatures here below!” Amen!!! 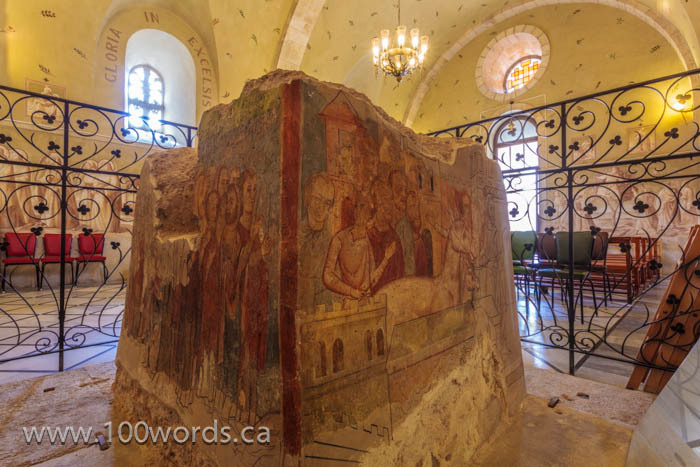 Also on display in The Palm Sunday Church is a large square rock on which the story of the donkey is told by an artist. Jews of all ages visit the Western Wall, which is the retaining wall of the platform which enabled the creation of the large flat area on top of Mt. Moriah, where the Temple once stood in Jerusalem. Large numbers of men and women come here to pray. Today’s reading is about the prayers God ignores and those prayers to which He pays attention. Playing in its streets.” …Let us continue to go and pray before the Lord! Zechariah 7 sounds like a good prayer at first reading, but then we understand that their prayers were all about themselves, not about God and others. An example of this kind of prayer is found in Isaiah 58, “They made their hearts like flint!” (7:12a). But God, through Ezekiel who prophesied in Babylon during the captivity of the Jews, said that their hearts would be changed! “I will give you a new heart and put a new spirit within you; I will take the heart of stone out of your flesh and give you a heart of flesh. I will put My Spirit within you.” Read Ezekiel 36:24-28. Zechariah 8 is the result of the genuine repentance of God’s people during the years of exile in Babylon. Renewed and rebuilt Jerusalem is a beautiful picture of contentment, old men and old women sitting in the streets with boys and girls playing around them. Let us learn the lessons taught here. As Jesus said, “Ask…seek…knock” in consistent God-centred and people-centred prayer, and God’s promises are activated for the good of all. Read Jesus’ Words on this in Matthew 7:7-11. Lord God, as Jesus was asked, so I ask, “Teach me to pray!” I pray not just for the words to say, but to actually “Pray!” You said through James, “Confess your trespasses one to another and pray for one another, that you may be healed. The effective fervent prayer of a righteous man [or woman] avails much!! !” Give me grace to always have a soft heart for others and toward You! I ask this in the Name of the One who got up early in the morning to pray, our Lord Jesus Christ. Amen! (Mark 1:35). Every day I thank God for what feels like excellent health. I have now lived for over two years past the date when it was predicted I would die. I was diagnosed four years ago with MDS acute leukaemia. King Hezekiah of Judah was told that he would shortly die, but God gave him another 15 years (Isaiah 38:1-5 and 38:21). Also the prophet Isaiah (obviously some kind of medical practitioner) prescribed treatment. In Isaiah 39:8 Hezekiah commended Isaiah for “good” prescriptions (words of advice). P.S. God willing, tomorrow, I want to emphasize my heartfelt thanks for everyone who prayed for me individually, and for the churches and ministries that prayed collectively. These ladies with a child are from Harran, which was a major city in ancient Mesopotamia, reflecting the title of today’s blog. A single olive tree blooms just outside of this northern section of the wall of the Old City of Jerusalem. The symbol of the spiritual life of Israel is the olive tree. In chapter four, the Governor of Judea, Zerubbabel, and the High Priest, Joshua, are likened to two olive trees whose lives and ministries flow directly in the Holy Spirit in order to keep the lamps of worship to God and light for the people aflame. They have a 24/7 relationship with “the Lord of the whole earth,” and they understand that it’s “not by might [corporate military or political action] nor by power [personal influence] but BY MY SPIRIT, SAYS THE LORD OF HOSTS!! !” We need to understand that for us to do as Jesus said, as recorded in Matthew 5:14-16, “Let your light so shine before men that they will see your good works and glorify your Father in Heaven,” the Spirit of God must flow through us always. All our organizational strength and all our individual efforts won’t make spiritual renewal happen. It takes God’s Spirit and His flow through our lives corporately and individually. The vision of the huge flying scroll of chapter 5 should underline for us the importance God places on what we’re doing right now, paying attention to His written Word! In chapter 6 we read of “the Branch.” Turn back to the words of the prophet Isaiah and understand that these words written by Zechariah could only refer to the coming Messiah or “Christ” in the Greek language (read Isaiah 11:1-5). In Christ, the true holy eternal temple grows by the Spirit of God, not by the work of men’s hands (read Ephesians 2:13-22). Lord God, I pray that I will faithfully, by Your Spirit and not by corporate might or personal power, see Your purposes all take place. As the last words of today’s reading tell me, “This shall come to pass if you [me] diligently obey the voice of the Lord your [my] God.” In the Name of the One who always obeyed the Voice of His Father God, Jesus, the Christ, I pray. Amen!!! In the days before television, there was radio. Every Sunday morning as a child and a teenager, I would hear Rev. C. M. Ward, preacher on the Revivaltime broadcast, quote Zechariah 4:6, “Not by might nor by power, but by My Spirit, says the Lord of Hosts.” C. M. Ward was born in what was known as Cabbage Town, Toronto. This Canadian was considered by many to be the greatest preacher ever to minister on radio. Revivaltime originated from the headquarters building of the Assemblies of God in Springfield, Missouri, USA. When I was invited by the Assemblies of God to host Turning Point, their TV ministry back in the early 1970s, Brother Ward took me aside and said, “David, you need to understand why the leaders of the Assemblies have chosen you. It’s because you are a Canadian. Your Canadian accent cannot be identified as from the south or from New England. Canadians have a rather neutral accent.” All the time I was thinking,”accent or not, it’s got to be ‘Not by might or by power, but by My Spirit says the Lord of Hosts. '” It was quite frightening to me to have a denomination of 15,000 churches, in the United States alone, and thousands more in other countries, ask me to do this. The call from Springfield came immediately after a week in Moncton, New Brunswick, when I preached each evening on the occasion of the opening of a new church building. I had fasted and spent much time in prayer that week, and by the end of the week I found myself interceding in fervent prayer for the people of the United States. This had never happened in this intensity to me before. I always thought that the USA had plenty of evangelists, and that I’d just stick to my beloved Canada. For every believer in Jesus, in one way or another, Jesus said, “You shall receive power [corporately and personally] when the Holy Spirit has come upon you; and you shall be witnesses to Me in Jerusalem [our home town], and in all Judea and Samaria [for me that was English and French Canada], and to the end of the earth” (Acts 1:8). That’s for every blog reader! Pray and give! Go ourselves or make it possible for others to go!!! This is a model of the Temple from the time of Jesus. King Herod renovated the Temple which had been built in the time of Zechariah 500 years earlier. This Temple was destroyed in 70 AD by the Romans. That word “prosperity,” in our first key verse, may have been a strange concept for these people who had been through very hard times. Ezra, the priest, who had led the original group of Jews back to Jerusalem from Babylon, wrote these words: “So the elders of Israel built, and they PROSPERED through the prophesying of Haggai, the prophet, and Zechariah, the son of Iddo” (Ezra 6:14a). Initially, Zechariah, a younger man, may have ministered as an assistant to Haggai. Zechariah’s book is the longest of all the minor prophets. It is truly a major message from God to all of us. With preaching, such as in our second key verse, it’s no wonder that the people responded by working together in unity to complete the Temple construction and restore the worship of the One True God. The “wall of fire” would provide protection against temptations from within, because of the glory of God inside, and protection from the attacks of the world from outside. As we daily live in the presence of God, worshipping and serving Him, He’s got us covered! Lord God, I pray that I will never take You for granted, but take You at Your Word! May I rely on Your promises daily, promises such as those found in our key verses. I believe that You are my “Prosperity,” and “The wall of fire” protecting me. Grant that I may be always at peace and that I may be encouraged in my service to You. In Jesus’ Name I pray. Amen!!! I am a greatly blessed man. I’m prospering as a result of the preaching of God-called preachers/pastors. I believe and preach that one should be totally loyal to one’s home Church and Pastor, being present whenever a service is convened. But I also believe and teach that with that solid foundation of loyalty, we can be blessed and encouraged by others. During one period of my life, I went to three Sunday Schools every Sunday: our own church at 10 a.m., the Christian and Missionary Alliance at 2 p.m. and the Salvation Army at 3 p.m. I can hear it now, “This boy had the makings of a fanatic!” Well it just depends on one’s definition of the word “fanatic”…e.g. a sports “fan-atic,” or “someone who is more enthusiastic about their cause than you are about yours.” Anyway, the people of Jerusalem worked with unusual enthusiasm in their cause due to the preaching of those two preachers, and the result was that they prospered!!! Yours for loving and serving God with all our hearts, minds, souls, and strength! Seen on the right of the photo is the Tomb of Zechariah. It is located on the foothills of the Mount of Olives facing the Temple Mount. It is cut into the rock and made entirely from that rock. Tomorrow, God willing, we begin our readings in the book of Zechariah. Haggai and Zechariah ministered in Jerusalem as a dynamic duo following the first return of the Jews from Babylon. These two prophets had the assignment of urging the people to complete the rebuilding of the Temple. Now therefore, thus says the Lord of hosts: “Consider your ways!…” Thus says the Lord of hosts: “Consider your ways!…and I will shake all nations, and they shall come to the Desire of All Nations, and I will fill this temple with glory,” says the Lord of hosts. Haggai was probably one of the older generation who remembered what the Temple of Solomon had looked like. They started construction of a new Temple with great enthusiasm (read Ezra 3:10-13). But the people who had not been to Babylon harassed and discouraged the project. Construction was halted as a result, but Haggai and Zechariah did their job and the Temple was finally completed (read Ezra 4:24-5:2). The word “consider” is repeated by Haggai five times. Daily through this blog we “consider,” “think about,” “contemplate,” “examine,” “review,” “ponder,” “evaluate,” “assess,” etc. Haggai tells his people and us, “Consider your ways!” As a result of Haggai’s preaching, “The Lord stirred up the spirit” of both the governor and the high priest and resumed building the Temple (Haggai 1:14). Consider Haggai 2:5-7. King Herod, 500 years later, enlarged their Temple, and when Jesus entered that Temple, the “desire of all nations” was present (Haggai 2:7). The ultimate fulfillment of Haggai’s prophecy will be at Jesus’ return to Jerusalem, as predicted by the angels and recorded in Acts 1:6-11. Lord God, through this blog and through the preaching of my pastor, I pray that my spirit will be stirred up so that I may be motivated again to work tirelessly for You, working with Jesus Who said, “I will build My Church,” and in Whose Name I pray. Amen!!! P.S. The Day Unto Day series consisted of eight books published over two years. Although it has been out of print for over 20 years, when you do a Google search, it’s amazing how many copies are still floating around for sale. For example, here is one, here is another. On the right of the photograph you can see the southwest corner of the Temple Mount area. The broken foundations of the walls were built thousands of years before modern Jerusalem’s walls. Seen in the middle of the photo are new buildings in modern Jerusalem built with the same kind of stone that was used by builders down through the ages. The people who live in these buildings want to be near the Temple area where they “call on the Name of the Lord” with “a pure language.” Hebrew has been restored as the language of modern Israel (Zephaniah 3:9a). Today’s reading begins with a description of the condition of Jerusalem’s leaders at that time. There are corrupt princes, judges, prophets and priests (Zephaniah 3:3) who are in place. But this will not last! Zephaniah is coming on strongly! Daniel and other godly young men are about to come on the scene to shepherd God’s people under the coming Babylonian rule. Zephaniah is optimistic about the future. God gives him prophecies that are full of promises of God’s favour. Our key verse is filled with hope! Someone has said, “The future is as bright as the promises of God!” As the above photograph shows, Jerusalem, as a city, has been restored. And the spiritual “City of God,” described by Zephaniah, is under construction by the Spirit of God. Jerusalem is the only city for which the Bible asks readers to pray. Let’s do this today! Let’s all read Psalm 122. Yes Lord, I am praying for Jerusalem. I sing with You! I am glad and rejoice with You! (Zephaniah 3:14). I have seen the fulfillment of Your promise, O Lord, to bring the Jewish people back to Israel. Now, Lord, I pray for a mighty spiritual revival where Your Messiah, Jesus, will be Lord and Saviour for the majority! In His Name I pray. Amen!!! I understand that by about 65 A.D. close to a majority of the people of Jerusalem believed that Jesus of Nazareth was Messiah. But then, because of persecution by the Roman appointed High Priest, the actions of those who wanted to overthrow Roman rule, and the cruel response of the Roman authorities, thousands of Jewish Christians left Jerusalem and settled elsewhere. Jerusalem and the Temple suffered destruction in 70 A.D. Eventually, the Romans would not allow Jews or Christians (who were mostly Jews) to live in Jerusalem, and so it became a totally pagan city for at least 150 years. Jews and Christians trickled back there around the year 320 A.D., after Constantine became Emperor of Rome. I must comment on God’s promise of Zephaniah 3:9, “I will restore to the people a pure language.” In 1979 Crossroads produced a movie called “Apples of Gold.” In that movie our film crew interviewed an elderly lady who was the daughter of Eleazer Ben Jehuda. She told how her father was awakened in the middle of the night and heard a voice saying to him, “You are called to revive the Hebrew language as the everyday language of the people who will come to live in a future state called Israel.” That is exactly what has happened! Today even the menus in the Jerusalem restaurants are in Hebrew. A language that had been dead since the Babylonian captivity has been revived. To my knowledge, this has never happened before to any people. I think we can assume that the other promises given by God through Zephaniah will also be fulfilled!!! There are now dozens of Jewish Christian congregations throughout Israel that conduct their services in Hebrew. Zephaniah wrote of God, “He never fails!” (3:5) and God said, “Therefore, wait for Me!” (3:8a). P.S. I couldn’t help but begin singing the song, “God can do anything but fail” (click here for the Charlotte Mass Choir with soloist Albertina Walker). Today, 3,000 years after David fought Goliath in this valley of Elah, Israeli farmers plant crops here to feed their people. In ancient times Israel lived in the mountainous regions and the Philistines on the more productive farmland all the way to the sea coast. Today’s reading informs us of God’s future judgment on the Philistines and other nations which surrounded Israel. “Righteousness,” “humility,” “pride,” and “arrogant threats” are contrasted in today’s reading! As people whose desire it is to be followers of Jesus, the One Who humbled Himself even to death on the cross, we must learn to be humble before God and people. Pride brings trouble! (Proverbs 13:10). Pride hardens hearts! (Daniel 5:20). Pride causes spiritual decay! (Hosea 7:9,10). Pride hinders our progress! (Proverbs 26:12). “Pride goes before destruction and a haughty spirit before a fall” (Proverbs 16:18). It seems that those who seek God and humble themselves before Him are in a perpetual minority. We must firmly resist cultural pressures to just go along with the crowd. For those who believe in the cross of Jesus, “the Lord’s fierce anger” (Zephaniah 2:2) has been born by Jesus as our Substitute. But what about those such as the nations around Israel and Judah who chose to remain in pride and arrogance rather than humbling themselves before God. It is a fact that the majority have it wrong. Jesus said that the “many” are headed for “destruction,” and the “few” for “life!” (Matthew 7:13-14). Lord God, I pray for grace to live humbly before You and before people. You have promised that as I do this, You will lift me up. I thank You Jesus that You humbled Yourself even to death on the cross. I pray this in Your Name Jesus. Amen!!! The “Standing Orders” from Jesus to His followers is printed on my T-shirt (pictures below). I must obey Him at all times. Sharing the News of Jesus with “All the world” is not optional for me!!! My wife and family feel the same way about their lives and time here on earth. I am facing some major decisions regarding future ministry responsibilities. Please pray fervently for me over the next few days. I need a breakthrough from Heaven concerning any days, weeks, and months during which God may spare the life of this almost 80 year old man!!! Perhaps I will be able to report about this in about two weeks, God willing!!! Yours to participate in reaching the world for Christ!!! Orthodox Jews reading the Scriptures and praying at the “Wailing Wall” or Western Wall of the Temple Mount in Jerusalem. Today’s reading, Zephaniah 1, tells us of the day (a period of time) when Jerusalem shall hear “the sound of a mournful cry” and “a wailing!” (Zephaniah 1:10). And have not sought the Lord, nor inquired of Him. Zephaniah is the great-grandson of King Hezekiah. Hezekiah led in calling the people back to the true God. But the king’s son, King Manasseh, reintroduced the worship of Molech (“Milcom” – 2 Chronicles 33:1-10), and Hezekiah’s grandson, King Ammon, continued the pagan practises (2 Chronicles 33:21-25). Ammon’s son, King Josiah, picked up from His great-grandfather, Hezekiah, and reformation and revival took place (2 Chronicles 34:29-33). So this makes Zephaniah and King Josiah second cousins. No doubt the ministry of Zephaniah was a big factor in the repentance before God, which began six years into Josiah’s reign and continued for about 25 years. Zephaniah’s preaching and teaching is centred on the judgment which Judah will bring on itself if they fail to repent! He uses the word “day” 11 times in this first chapter. The Judgment Day is coming. Zephaniah, his cousin, King Josiah, and their generation were spared from the “trouble,” the “distress,” the “devastation,” and the “desolation” which would come later, after Josiah’s death, in the destruction of the Temple and Jerusalem by the Babylonian King Nebuchadnezzar. Let us NOT “turn back from following the Lord!” Let us NOT turn back from seeking the Lord and inquiring of Him!!! This blog is designed to help us SEEK and INQUIRE! Lord God, I seek You today. Lord Jesus, You said, “Seek and you shall find!” (Matthew 7:7). I pray for persistence and consistency in inquiring of You, learning of You through daily reading Your Word, meditating on Your Word, and praying constantly for grace to apply Your Word to my life. I pray for this with all my heart in the Name of the One Who is in Himself the full expression of what You have to say to Your human family, the Living Word, Jesus Christ! Amen!!! It will be four years on June 3rd, 2016, since I started this daily two-year journey through the written “Word.” On June 3rd, God willing, I plan to continue for another two years, beginning in Matthew’s Gospel, moving to Genesis, Mark, Exodus, and so on. It will continue to be fresh bread every morning with God, the Holy Spirit, as the Fire which bakes the bread. I’m up like a good baker, mix the ingredients, put them in the oven of prayer. The bread comes out of the oven at 6 a.m. and is put on a shelf for you to pick up (via the the Internet). I need help to advertise this bakery. Please tell others where to find this fresh bread. You can email or post on Facebook the link to www.100words.ca. Thank you for spreading the word! Yours for fresh bread every day!!! P.S. Speaking of fresh bread, the most delicious bread that I love to eat in Jerusalem is pictured below…big, soft bagels! You will find many street vendors like this man pushing his cart-load of bagels around the Old City!